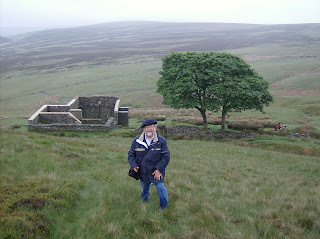 At the beginning of February 2012 I learned for the first time about the existence of the Brussels Brontë Group. Reading about the Brontë Society’s Annual General Meeting in Haworth, all at a sudden, an old and dormant dream reared its head. It was at the end of the sixties that Heathcliff, Cathy, Nelly and Mr Lockwood came in my life and never would leave it. That time I swore an oath that one day I would go over there and see Haworth, the Parsonage, Wuthering Heights, the Brontë Waterfall, Penistone Crag and Thrushcross Grange and experience the atmosphere of the Moors in good or bad weather, in rain, sunshine or in the clouds. However, everybody knows how the river of life can flow in a strange riverbed before it is flowing into the sea. In my particular case, full with obstacles and it would take me fifty years before this dream came true. Perhaps you will find that I am exaggerating but one could compare this trip with the last five days of Sir Edmund Hilary and Tensing Norgay on their Himalaya Expedition, climbing and climbing till they reached the top of Mount Everest on May 29, 1953. Arrival at Haworth, my “base of operation”. The programme planned so carefully was now to be carried out. Would I, just like Hilary, reach the summit too? After exploring the Parsonage and Haworth I joined the Brussels members in the Old White Lion where I also made new friends and experienced for the first time that I had made a step in the direction of this small piece of Heaven on earth, or to the top of Mount Everest. The second camp was attained. With my new membership card in my hand, somewhat enjoying being, as a Belgian, a member of a British literary society, I walked into the conference room on the first floor. For a newcomer as I was, it was the people attending this meeting who drew especially my attention. Young, middle-aged, old and very old, all interested in one thing, the progress of this beautiful part of British Heritage: “The Brontë Family”, a special experience, a special feeling. We kept talking and talking for hours because there was so much to tell although it was only my second day. And when for each of us the time came to go back to our B&B or hotel, I realized that not me, on my own, but all these people together, this crew, our “expedition”, had reached our third camp on the way to the summit. Breakfast time in the B&B was not simply enjoying the copious delicious meal prepared by David but at the same time taking part in the “group discussion” with other members about what else than… the Brontë Family, Charlotte, Jane Eyre, Emily, Cathy, Heathcliff and so on, the whole family “passait le revue”. Each one of the guests with his/her point of view and sometimes trying to convince the others. 1.00pm: Walk around historical Haworth. 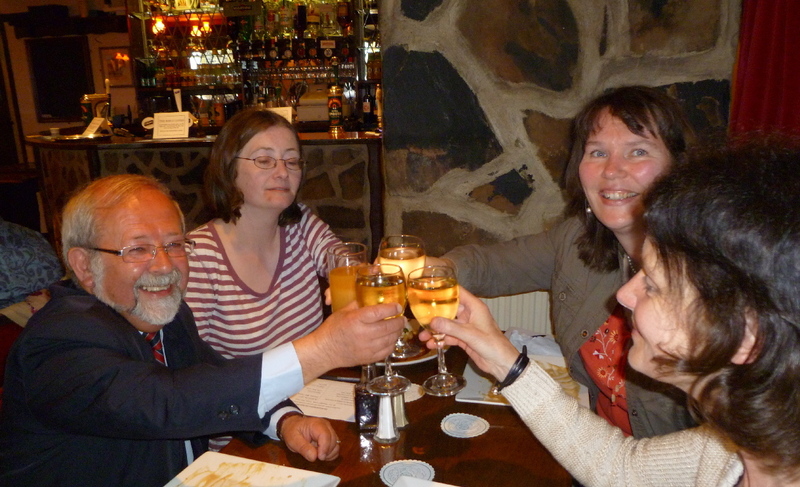 6.30pm: Informal evening of friendship, fun and food at The Old White Lion. Today the informal evening of friendship was officially organized by The Brontë Society but we had already had two and this one could only extend this magnificent feeling. Every evening, meeting with these friends after the daily occupations was just bringing us to a higher level of harmony, bringing us to the next camp, the camp of Hilary and Tensing before their effort to reach the top of Mount Everest. So I felt. These everlasting conversations about all kind of subjects, from “the Brontës” to our own families (we even drew sketches of our houses), literature, movies, music, all this meant that we realized that the moment when we would have to say good-bye would be difficult for each of us. This day I was to realize my dream of more than 50 years, the reason why I was coming to Haworth. Sarah, my guide, was to take me and possibly a few other people to do the walk over the moors to Wuthering Heights (Top Withens), The Brontë Waterfall and Bridge, Penistone Crag (Ponden Kirk) and Thrushcross Grange (Ponden Hall) back to Haworth. 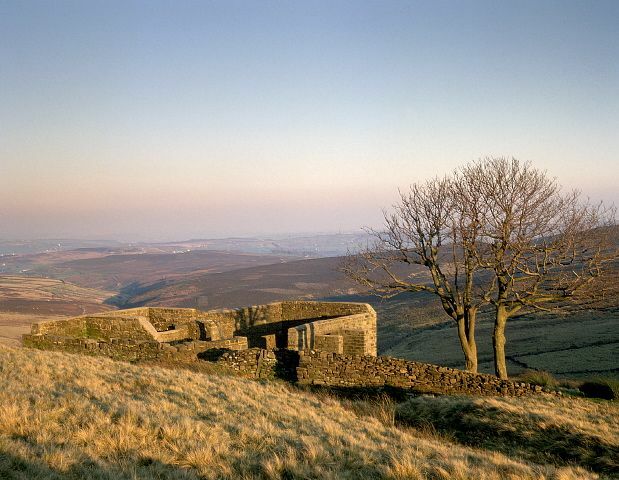 The places so beautifully described by Emily Brontë in her novel “Wuthering Heights”. Whatever the weather should be, I wanted to do it, wanted to be another Mr Lockwood or Heathcliff and go to these places. And here comes again my comparison with Sir Edmund Hilary: this last and famous trip meant to me, perhaps, something similar to what it might have meant to him: the last day bringing me to the summit of my stay in Haworth, as if I was stepping into the story and experiencing a little bit what was told so well by the author two centuries ago. We were joined at the last moment by a young Swiss man who had read about the trip on the Haworth website. We were ready, our clothes, our boots, our packed lunches, and soon we were marching, leaving Haworth behind us, soon entering into the moors and in my mind, at the same time, going back into the nineteenth century. For me, unknown rough territory but I enjoyed it, especially because of the whole story behind it. The weather was what it should be: the sun was not shining but it was cloudy with low-hanging fog banks, some wind, from time to time a little bit of drizzly rain alternating with an up-clearing sky. I became a part of this “Brontë atmosphere”. The landscape was varying very strongly, we followed the path of the sheep, climbed to the crest of the hill, got for the first time a glance of a distant tree near Wuthering Heights, descended, and climbed and descended again to arrive at the end at Brontë Waterfall and Cathy’s chair. We wanted to stay longer but the way ahead was still so long and so many places had to be seen so that we continued our path, direction Brontë Bridge. Marvellous place with the splashing water in the wild nature. Some photos taken at the spot should help to keep it saved in our brain. And again we continued our path, sometimes talking, sometimes in silence listening to the splashing water of the brook, a bird in the sky, the bleating of a faraway sheep or just to the wind in our ears, climbing out of the valley towards another crest of the hill, passing through the haze to find out that this distant tree ahead, finally, is close by and we are only some hundreds of metres away from “Wuthering Heights” (Top Withens). “This farmhouse has been associated with "Wuthering Heights", the Earnshaw home in Emily Brontë's novel. The buildings, even when complete, bore no resemblance to the house she described, but the situation may have been in her mind when she wrote of the moorland setting of the Heights”. The building in itself may be unimportant, but not so the location. We took the time to have our lunch in this sacred place so that we could stay a little bit longer, experience the atmosphere, feel nature, join Emily’s characters and of course take some pictures to preserve this place for posterity. Had I now reached the summit? Yes and no, because Penistone Crag (Ponden Kirk) and Thrushcross Grange (Ponden Hall) belong as well to these places that had to be seen. And so we continued our walk to Penistone Crag. In reality a grit stone outcrop, a nature reserve but for Brontë fanatics a place where the two young people in love, Heathcliff and Cathy and later Hareton and Cathy’s daughter, met each other to find some happiness. What a feeling, how wonderful to stand there on top of this rock in the idea that Emily Brontë one day must have stood there admiring the beautiful landscape. Only Thrushcross Grange (Ponden Hall) remains to be seen, the contrast with Wuthering Heights, the contrast between a humble farm and a manor. The path to Ponden Hall is much easier as we are descending to the valley, more houses and farms appear and the landscape shows more signs of people’s activities. After a while we pass some outhouses and a little later an impressive house with a stately entrance, many windows and surrounded by a garden and a high imposing wall. At the other side of the road another garden, also surrounded by a similar imposing wall. Ponden Hall. Sarah, our guide, tells us: “This is Thrushcross Grange in the novel”. What a difference with “Wuthering Heights”, a difference that makes one better see all the consequences and influences on the lives of the characters. Now, after all these years, having been there, I better understand this wonderful novel. The task was fulfilled, the summit was reached. With some luck we would have had a guided tour of the house by the owner but the lady of the house had to leave. The window in the bedroom where Cathy begs: “Let me in, let me in” I did not see, perhaps this is for another time. Slowly we took the way to Stanbury which further on would lead us back to Haworth. An intense feeling of contentment came over me because the dream of more than fifty years had come true. Sir Edmund Hilary had reached the summit of Mount Everest, I had been in the places I dreamed of and that was for me the summit. It took us seven hours but these seven hours gave me such a strong wonderful feeling, put me in such a pleased mood that I wanted to share it with all my friends. For me and for a lot of our friends this supper was indeed the last one before our return journey back home. The Old White Lion was filled up with a magnificent ambience of joy, understanding, kindness for each other. The room was filled with sparkling conversations alternating with laughter from different sides. But as the clock was ticking and the time of farewell came closer, here and there in a hurry addresses and e-mail addresses were exchanged because one thing was sure: I had made a lot of friends and wanted to stay in contact with them. And when then the ultimate moment was there and we really had to say good-bye I felt pain in my heart because such a spirit, such an enveloping warmth between so many people, I never had experienced. It was here that a new, another dream was born, the dream to come back, perhaps next year, perhaps one day if I should get the opportunity. 8.00 am: Enjoy for the last time David’s English Breakfast, arrange the last formalities, pick up my luggage and take a glance at my room, appropriately called the “Charlotte” room. Good-bye to David and, on my way to The Old White Lion from where I was to leave by taxi for Keighley, a last look at my B&B. Good-bye to Haworth, Keighley, Leeds, London and back to Belgium. My body was in the train but my mind and my heart remained in Haworth. In the evening I came home, happy to be back with my family but with a heart that brimmed over with enthusiasm about my adventure in the neighbourhood of the Brontë Family and I realized, indeed, Haworth is a little piece of Heaven on earth. I finally made it to Haworth to attend the Brontë AGM after many years of wanting to do so. All in all, it was not unlike how I had imagined it would be; a small village on a hill surrounded by the moors. However, the Brontë Parsonage was somehow bigger than I expected (although for the family themselves given the ladies’ fashions of the day, space must have been tight!). The Brontë Parsonage Museum is partly manned by volunteers who did not disappoint in their dedication and friendliness. Predictably too, Haworth is packed with Bed and Breakfasts; ye Olde Teashops and so on. Nonetheless, a suggestion of tweeness is effectively counteracted by the weight of the history of Brontë family; and the magnificence of the moors. A wide variety of accommodation is on offer (in some cases at top prices) by the locals in the absence- thank goodness - of modern hotel chains. 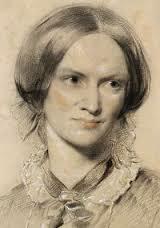 Great efforts are made to create an old world atmosphere in line with the Brontë story. Especially the standard of breakfasts and bakery is high (waist watchers be warned); although the tidying up of bathrooms seemed somewhat erratic; endless supplies of fresh towels either piled high on the bed or in definitely twee baskets did not address this issue. What I saw of the surrounding moors while green and lovely was much less wild than I had expected (not at all suitable for Cathy and Heathcliff’s ghosts.) But time for rambling was limited due to the busy academic programme on offer. 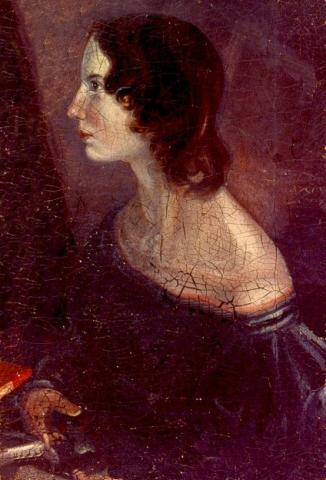 While packed with interesting speakers the connection with the Brontës was at best tenuous in many cases. The showing of the documentary film led to a passionate but ultimately inconclusive debate as to whether Heathcliff was Irish or black Caribbean – the jury is still out on this one and likely to remain so! A further surprise was the existence of two Haworths – upper and lower – connected by a beautiful and somewhat empty park and a steep hill. Again, it was a Patrick Brontë connection which provided perhaps the most special feature of the weekend. A visit to nearby Guiseley Church to view the marriage certificate also provided the opportunity to meet a real live Patrick Brontë relation through his sister. Carol was sitting in the Church quietly waiting for us and seemed pleased if somewhat bemused as Brontë enthusiasts eagerly quizzed her on the connection dating back 200 years, about which she had herself learnt only recently! Even an actual family resemblance was not ruled out!! On Sunday 10 June one of the walks scheduled was the tour of Haworth graveyards with Ian Dewhirst (a local historian and a real Yorkshire man) as our guide. About 25 people met Ian near the Sunday school entrance and we started off first with the graveyard next to the church (which is the oldest graveyard of Haworth). Apart from the so-called Brontë graves (The Brown tombstone and Tabitha’s grave) we visited a number of very interesting graves, although sometimes very difficult to decipher (a brush would have been handy sometimes!). In his very recognizable Yorkshire accent Ian had great stories to tell at a lot of these graves: the story of the Highwayman (James Sutcliffe), the story of the last hand-loom weaver (Timothy Feather), the story of the man lost at sea (Elkanah Merrell) and of the woman lost at sea (while on her way to seeking a new life in Australia – Elisabeth Hartley), the story of the assumed Haworth poisoner (John Sagar), the story of the honest gamekeeper (John William Moore) and many more. There were some very beautifully carved gravestones e.g. the gravestone with the stone infant laid with his head resting on a pillow (Heaton), or the musical gravestones with hymns carved in stone. With half of our group left, we then set off on our way to the municipal Haworth graveyard (off the Stanbury road) where Ian showed us some more interesting (newer) graves: the grave of Lily Cove (the parachutist who crashed with her balloon in Haworth), the grave of Anita McCluskey (a BS Council member with a quote from Wuthering Heights on her gravestone), some beautiful war graves, some special children’s’ graves, a murder victim’s grave, gravestones with beautiful poetry, etc…. We then continued our journey to the Baptist churchyards (near West Lane’s Baptist church): a little bit hidden away, but still worthwhile visiting (one grave was particularly remarkable in that it had a huge pint of stout on the gravestone: old Harry “the hat” Denton liked his pint in the Old Sun! and had it carved on his grave when he could no longer visit “The Sun”). After approximately three hours of rummaging on graves we finally ended this very lively and interesting tour on West Lane where we said goodbye to our guide Ian. Since I read the book “Ghosts and Gravestones of Haworth” by Philip Lister I had been looking forward very much to this graveyard tour, and I must admit: I was certainly not disappointed. We could not have wished for a better guide than Ian. We were promised a treat and we definitely got one, and certainly one to my liking!! I thoroughly enjoyed it. Eight members of the Brussels Brontë Group attended the Brontë Society weekend in Haworth this year and experienced the delights of a few days in Yorkshire. We ate too many cakes and meat pies. We filled our lungs with the bracing air of the moors. We experienced, too, the specific delights of the Brontë weekend. Such as encounters with friendly, talkative Society members sharing inside knowledge of local places with Brontë connections, and coach excursions to some of these places, where we were ably guided. Highlights included a surprise meeting with a Brontë descendant – for obvious reasons not descended directly from Patrick Brontë and his children, but from a sibling of Patrick’s – and a tour of Haddon Hall in Derbyshire where the 2011 film of Jane Eyre was shot. The Brontë descendant was waiting for us in the parish church of Guiseley, now a suburb of Leeds, where Patrick and Maria Branwell were married in 1812. This lady had been unaware that she was a descendant of Patrick’s sister Sarah until a Brontë Society member (who was also present in the church to receive us) researched the link. We had our photos taken with her by Patrick and Maria’s marriage certificate. From our guide at Haddon Hall, whose battlements have featured in many movies over the years, we heard stories of the making of the feature film of Jane Eyre last year and the BBC series starring Ruth Wilson in 2006. The tale, for example, of the fibreglass tree that was made at great expense for a particular scene, only to split in two in the wind on the night before the scene in question was filmed; and the calls made to the fire brigade because the special effects used for the shots of the Hall on fire were so realistic. Another enjoyable excursion was the one to Red House in Gomersal, the home of Charlotte’s schoolfriend Mary Taylor and now a museum. Mary and her sister Martha were at school in Brussels at the same time as Charlotte and Emily. Martha died of cholera while in Brussels and a member of the Brussels Brontë Group has been researching what happened to her grave when the old Protestant cemetery was closed. Red House and the Taylor family inspired “Briarmains” and the Yorkes in Charlotte’s novel Shirley, and the museum provided plenty of background to this novel of industrial unrest. In Haworth itself, we had the usual varied programme of talks and entertainment. We saw a demonstration of 1830s costumes by the “History Wardrobe”; viewed a film on the question of whether Heathcliff - who was rescued from the streets of Liverpool, a centre of the slave trade – could have been black, a theme that ties in with the recent Wuthering Heights film; and enjoyed entertainment over dinner at a local hostelry. A Brontë weekend in Haworth would not be complete without a graveyard tour and the numerous ghost stories told each evening in the pub. Every inn in the village has its haunted room, whether or not connected with the Brontës, and we were given copies of a novel whose narrator is the spirit of Charlotte Brontë interacting with modern-day inhabitants of Haworth; its author claims to have written it at her dictation… If any of the Brontës’ ghosts were present at the weekend’s events I hope they enjoyed them as much as we did. 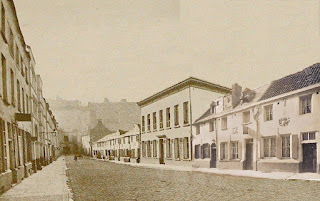 Photomontage of how the street would have looked in the 1840s, when Charlotte and Emily Brontë stayed there.